Well, you can’t say the show wasn’t big enough. 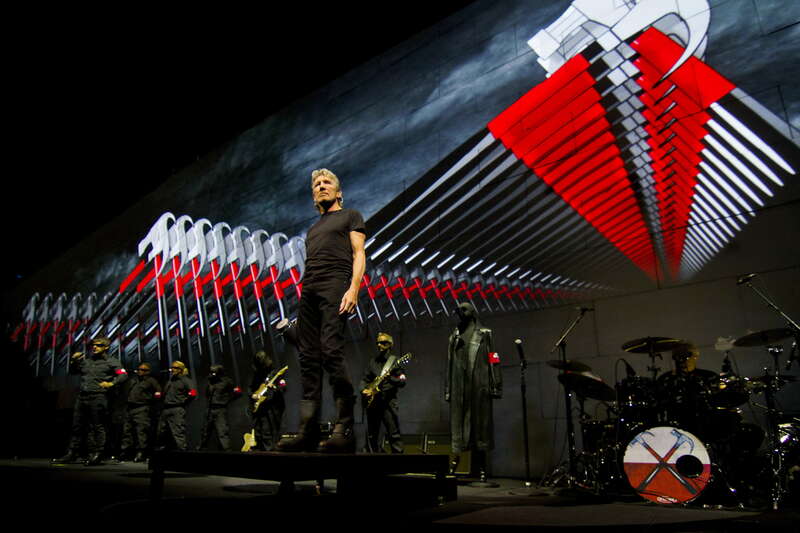 Infamous rock-curmudgeon Roger Waters has finally released his long talked-about movie adaptation of The Wall and it is, as you might expect, a mammoth undertaking. Co-directed by Waters and Sean Evans, it’s essentially a documentary, culled from the show’s three year long world tour. The concert footage is intercut with a more personal tale, in which Waters drives across France and Italy to visit the graves of his grandfather and father, both of them the victims of war. It makes for a lengthy cinematic experience, a bum-numbing two hours and fifty minutes in total. The original double album was, in Waters’ own words, ‘the whinging of an over-priviliged rock star.’ But across the years, it has developed into something more worthy, a powerful polemic about the futility of war and a tribute to ‘the fallen.’ There’s no doubting Waters’ absolute sincerity in this, even if the personal footage occasionally feels a tad over-indulgent. I could have done without his drunken ramblings to an Italian barman, but the scenes where he plays a simple trumpet theme in two different graveyards is, it has to be said, touching. As for the show itself, The Wall is what it has always been – a great big sprawling carnival of sound and light, shot through with occasional flashes of pure brilliance. I always thought that it was a patchy double album that could have been a killer single album. As somebody who has been a Pink Floyd fan since 1967, this was of course, a movie I had to see – and it’s definitely a marked improvement on Alan Parker’s rather shrill attempt to film it in 1982. It’s not all plain sailing though. In this day and age, the scantily-clad female imagery that accompanies Young Lust looks suspiciously like an old rock star having his cake and eating it; and despite Gerald Scarf’s wonderful cartoons to accompany The Trial, I was never convinced that this part of the show actually works. But there are so many other highlights to relish here; the jaw-dropping visuals projected onto the wall as it is built between the band and the audience (such an audacious concept! ); the note-perfect guitar work from Snowy White and Dave Kilminster which capture David Gilmour’s sonic stylings perfectly; the hilarious Nuremburg Rally chic of Pink’s paranoia-filled stadium show, and the final spectacle of the wall coming down as a packed crowd bays for its destruction. The high point? It has to be Comfortably Numb. Close up shots of a transported audience howling the lyrics back at the stage, demonstrate how universally adored this song is – and the moment when Kilminster rises above the parapet to deliver that guitar solo has to be one of the defining moments of rock theatre. Overheard on the way out, a lady complaining to her husband that what she had just watched was ‘an endless anti-war rant.’ This seems a tad unfair, particularly as said husband had a distinctly beatific smile on his face. You don’t have to be a Pink Floyd fan to enjoy this film, but it certainly helps. 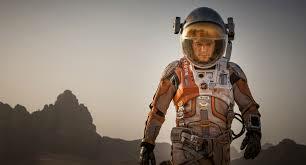 With The Martian, Ridley Scott takes us back into outer space. Given that his previous excursion in that direction was the much anticipated, but decidedly underwhelming Prometheus, there are many out there who didn’t have great hopes for this movie. Happily, their fears are unfounded, because this is the best Ridley Scott movie in a very long time. What follows is a fascinating and captivating couple of hours as Watney works out a complex plan to stay alive, starting with the idea of growing potatoes planted in the packaged human waste from the expedition’s toilet. Meanwhile, there’s an even more serious problem. The only music available to listen to is Lewis’s collection of disco hits circa 1980 – he may go stark raving mad before help arrives. 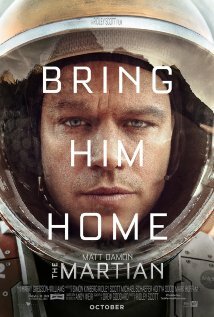 Damon is always an appealing performer and he’s perfect for the wisecracking, plucky Mark Watney. You’re rooting for him from the word ‘go,’ and as his position becomes ever more precarious, you feel every setback as keenly as he does. As the story moves on and his crew mates finally learn of his situation, proceedings metamorphose into a complex rescue mission, which results in an absolutely nail biting climax. What’s more, there are all the tropes we’ve come to expect from Ridley Scott – magnificent cinematography (with Wadi Rum in Jordan standing in for Mars), a fabulous soundtrack utilising the delights of Abba and vintage David Bowie, plus the absolute conviction that no matter how far fetched the story becomes, its backed up by a wealth of detail, enough to convince you that this really could happen. It’s ironic that I’m reviewing this film on the very day that NASA will announce a ‘major discovery on Mars.’ I appreciate that Scott always puts aside a huge budget for publicity, but that may be going too far! Scott, by the way, is pressing on with his production of Prometheus Two, so he isn’t quite giving up on outer space just yet. But The Martian is definitely a keeper. Watch it on the big screen and yes, for once, it’s actually worth booking for the 3D showing, because those vast, alien landscapes really are out of this world. To be fair, the film is slickly directed and well acted by its cast, but it’s fatally skewered by the fact that Clancy’s abilities are so pronounced, he comes across as some kind of psychic superhero, leaving his FBI partners with very little to contribute to the proceedings. One quick touch of the deceased (or one of their possessions … or a flower they recently touched…) unleashes a whole barrage of cinematic images in his head, which act as a kind of conduit for him to anticipate the killer’s every move. Not only does this seem quite ridiculous, it kills any sense of suspense the story might have generated. In the film’s final third, the killer steps into the spotlight only to reveal that (oh boy) he is psychic too, whereupon all hope of rescuing this movie goes straight out of the nearest window. 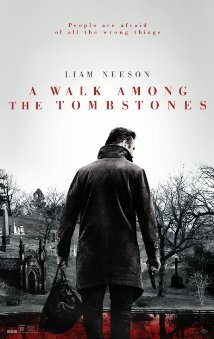 A shame, because it’s nicely done and entertaining in its own, galumphing way. Those who actually believe in the supernatural may enjoy this more than I did, but honestly, if so-called psychics really were this adept, police forces across the world would have a much easier time of it. 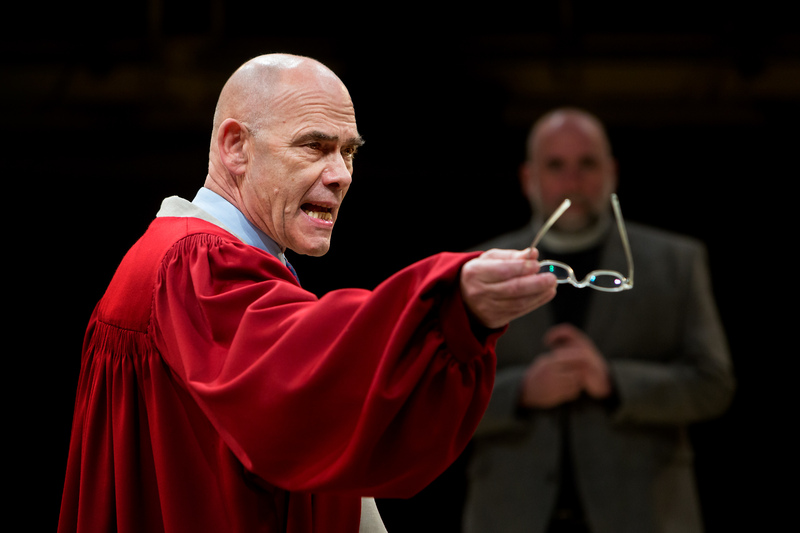 Arthur Miller’s The Crucible is, undoubtedly, one of the great plays of the twentieth century. Written in the early 1950s, it was based around actual events that unfolded in the Puritan community of Salem Massachusetts in 1689; it was also Miller’s opportunity to openly air his feelings about a current event, Senator Joseph McCarthy’s Communist ‘witch’ hunt, without fear of retribution. The similarities were there for all to interpret, but Miller was above reproach, as he could argue that he was simply retelling a slice of history – even though, on closer examination, it appears that he took considerable liberties with the facts. Luckily, nobody bothered to check. The Royal Exchange’s latest reinterpretation, directed by Caroline Steinbeis, is fascinating. It takes place on a stripped, circular dais across which the sizeable cast act and interact with considerable skill, so much so that when they take their final bow, you’re amazed to realise how many people are actually involved in the proceedings. 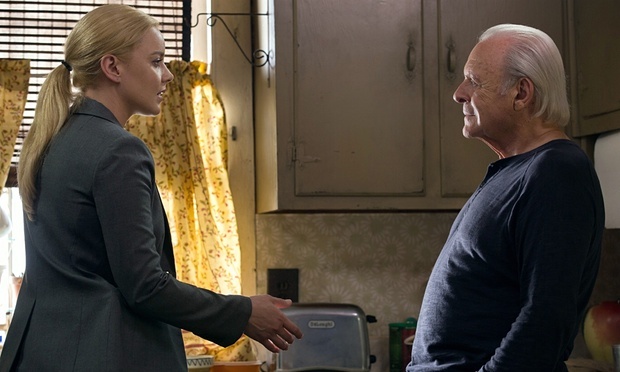 It’s no longer a period piece – there’s not a stovepipe hat or lace collar in sight. The male actors wear clothing that could easily fit into any rural community of the past thirty years, while the women are dressed in frumpy, near identical dresses, emphasising how much they are made to conform to the expectations of the God-fearing men who surround them. We’ve seen many versions of The Crucible, but few that delineate the various strands of the tale as clearly and powerfully as this one does, and, in an age where political and sociological witch hunts have become an everyday occurrence, the story seems more prescient than ever. 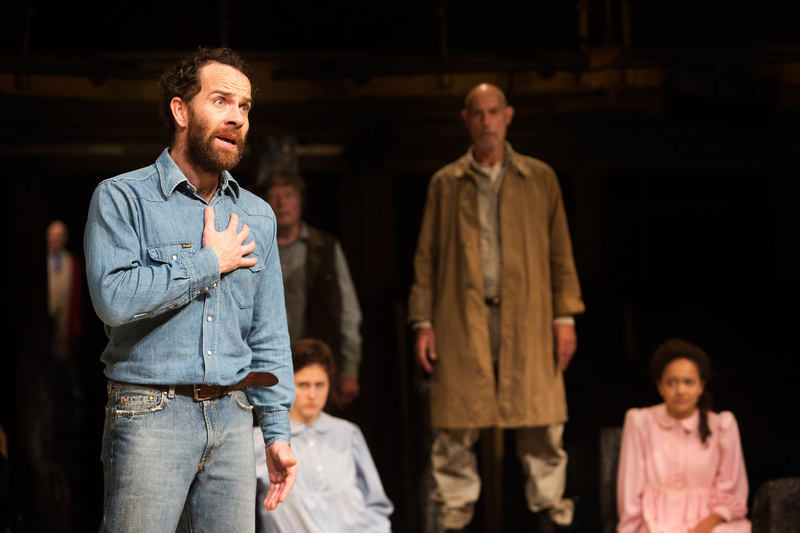 As John Proctor, Jonjo O’ Neill gives a dynamic performance, his strident Northern Irish accent lending his final scenes added power, while Ria Zmitrowicz’s portrayal of the hapless Mary Warren is also a highlight; who knew that there was so much comedy to be mined from her role? But it’s perhaps unfair to single out individual performances, when this is so undeniably an ensemble piece; there are, frankly, no false notes here. The Exchange is famed for its ‘wow’ moments and, in the final stretches of the play, that slightly inverted dais is suddenly transformed into a gathering pool of water under a jaw-dropping rainstorm – through which the protagonists are obliged to wade. Coming as it does during Proctor’s final confession, this seems to us to symbolise the way in which a truth can irresistibly spread, to engulf all those who would seek to adapt it to suit their own ends. It is also, perhaps, an allusion to ideas of rebirth and baptism. Others will undoubtedly have their own interpretations; whatever, it will certainly stimulate much after-show conversation as you head for home. This is a superior production, beautifully staged and expertly acted. Don’t miss it. The Horrible Histories TV team, take a fairly convincing step up onto the big screen with this radical retelling of the life of William Shakespeare. When we first meet Bill (Matthew Baynton) he’s playing lute with Stratford On Avon’s hottest band, Mortal Coil. However, his propensity for indulging in tortured solos, soon prompts them to tell him to ‘shuffle off.’ (This will give you some idea of the standard of jokes on offer). However, Bill feels he’s destined for the big time and writes his first play, a knockabout comedy, but when his long-suffering wife Anne (Martha Howe Douglas) is unsupportive, he sets off for ‘that’ London to seek his fortune. 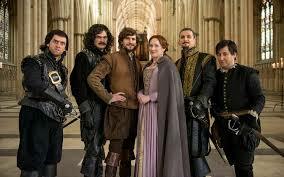 He soon falls in with down-on-his-luck playwright, Christopher Marlowe (Jim Howick) and together they write a new play – but little do they know that the dastardly King Philip of Spain (Ben Willbond) is cooking up a fiendish plot to assassinate Queen Elizabeth, (a gurning Helen McCrory) for which he needs one vital ingredient: a decent play. Fans of the TV series should enjoy this as the format hasn’t changed a great deal, with the familiar players taking on multiple roles. There’s plenty of slapstick for the younger viewers, some more intellectual asides to keep the parents happy and if the whole enterprise has the hit-and-miss feel of the average Monty Python film, it doesn’t really matter as the end result is rarely ever less than entertaining. 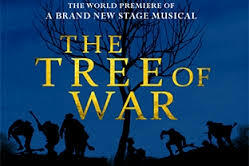 The First World War is a tremendously emotive subject and Oliver Mills’ and Rachel Mann’s The Tree of War, receiving its World premiere in this suburban Burnage church, explores the theme with a depth of sophistication not usually associated with an amateur production. It’s a tremendously ambitious project, utilising an ensemble cast, a live band, an ingenious set and some startling pyrotechnics (at one point clods of earth actually rain down into the audience!). “Serious’ musicals are notoriously hard to pull off, so it’s to the company’s credit that they do an exemplary job here. There’s a wide range of styles on offer, from wistful, plaintive ballads to lusty, marching songs. In the first half, a section of knockabout comedy in the trenches falls a little flat and feels like a temporary misstep, but the momentum is soon regained with a series of soldier songs exuberantly led by Harry Cooper (Will Spence), that have the audience clapping along, while the expertly paced second half never flags for a moment. There are some delightful set pieces here: a sequence set at a Women’s Fellowship meeting is beautifully choreographed and the delightful harmonising gives the female actors a real chance to shine; Scottish hard man Dougie (Jamie Rahman) gives a sweet rendition of ‘Being A Lad,’ and it’s a stony individual indeed who won’t be moved to tears (as I was) by the heartbreaking climax. Those who’d like to catch this show need to act quickly; it comes to the end of its five night run on the 19th of September.